Introductory prices are ending soon for coins commemorating 100 years of the world’s largest service club organization, Lions Clubs International (LCI). CoinNews photos of a proof silver dollar. The obverse shows Lions Clubs Founder Melvin Jones along with the club’s logo. The reverse depicts a male and female lion with a lion cub superimposed over a globe. Regular U.S. Mint pricing for the pair of proof and uncirculated Lions Clubs Silver Dollars takes effect on Tuesday, Feb 21, at 3:00 p.m. ET. At that time, buyers will need to pay $5 more for each one. Sales of the proofs are outpacing the uncirculated dollars by more than three-to-one. Most find proof coins more attractive with their frosted foregrounds and mirror-like backgrounds. The proof dollar stands with a 37,974 total while the uncirculated coin is at 10,921. 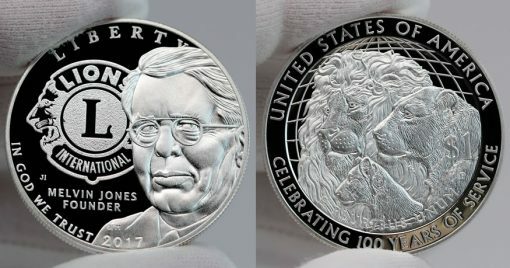 CoinNews photos of the obverse and reverse of an uncirculated silver dollar. The coins’ authorizing act, Public Law 114-30, mandates that prices include a surcharge of $10 for each sale. Provided the coins make money, the collected surcharges will be paid to: (1) further its programs for the blind and visually impaired in the United States and abroad; (2) invest in adaptive technologies for the disabled; and (3) invest in youth and those affected by a major disasters. Visit the U.S. Mint’s commemorative page for more information or to place coin orders. Is this the lowest mintage of a commemorative coin ever? That is one of the most sour-looking faces on any coin I’ve ever seen – matched only by Susan B. Anthony’s grimace on her namesake dollar. If ever there was a coin which deserves to be locked away out of sight – this Lion’s Club silver dollat is definitely the one. (“Not that there is anything wrong with that” – Seinfeld). A great reverse design & great charity organization.